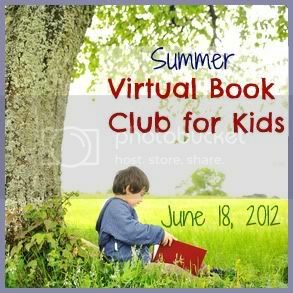 I am so excited to be joining a group of fantastic kid bloggers for the June Virtual Book Club. The June author that was chosen by the Kids Virtual Book Club is Mo Willems! Mo Willems is hilarious and can be enjoyed by kids and adults alike. For this Virtual Book Club, I decided to pass up on all of our favorite characters-- like Trixie from the Knufflebunny books. I decided to skip the funny pigeon, even though we adore the pigeon. I even decided to choose a book that was NOT illustrated by Mo Willems. I decided to choose the book, City Dog Country Frog by Mo Willems, illustrated by Jon J Muth. In this story, City dog visits the country in the spring, summer, fall, and winter. In the Spring, Country Frog teaches City Dog to play frog games. When City Dog returns to the country in the summer, they play Dog games. In the fall, Country Frog is tired and so they spend time just remembering. In winter, City dog arrives in the country but frog is not there. He can't find him anywhere. In Spring again, Country Dog finds a new friend- but he doesn't forget his old friend as he smiles a froggy smile. While it seems to be inferred that the frog dies, this story could be a beautiful way of helping a child deal with death, moving, changing friends, or deal with change in general. Speaking of beautiful, the watercolor paintings created by Jon J Muth help to tell this tale in a sensitive and poignant way. We decided to use those beautiful paintings to help in a study of seasons and also in learning about retelling a story. Before we read the story, we talked about the seasons that we knew. We talked about the words spring, summer, fall, and winter. After reading, we took a closer look at the seasons. We used the watercolor paintings by Jon Muth to help us understand the seasons. 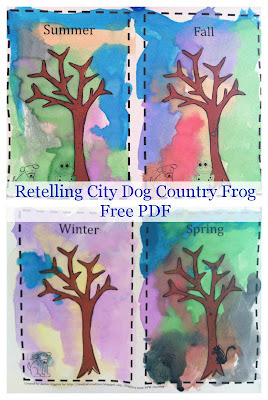 I created a simple little book for my boys to use to retell the story of City Dog Country Frog. I have a link to my free pdf of this printable book at the end of this post. On each page I included a tree along with a one word label for the season. 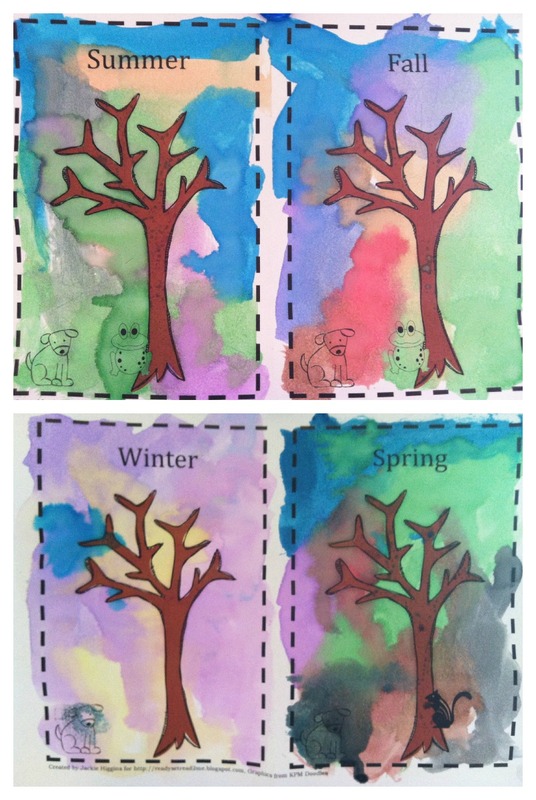 We used our watercolors to paint each season. I love the way my four year old, Logan, really studied the art when we was creating his winter painting. If you are familar with the book, you'll remember the purples and yellows on the page where City dog is standing alone in the cold. We discussed each season and which colors we would want to use. Sometimes he had his own take on what colors he actually wanted to include in his painting... and that was ok too. He also opted to paint all over the entire painting instead of painting the tree, the dog, and frog on each page. He was having so much fun (and he is my child who is rarely interested in painting). I just let him express himself!! After our paintings dried we were able to retell the story using our little retelling booklet. You can download this printable for FREE by clicking on the image below. If you like this printable, don't forget to check out my brand new Teachers Pay Teachers store and look for more reading resources! Do you have a book activity or reading lesson based on a Mo Willems book? Share it below to help create a great resource for parents and teachers! Love your printable. This is a very sweet book. I read it for the first time this week. I just found your blog. Loving it! I'm not sure how I haven't came across it before now. You chose a great book! This is one of our favorites and the only one we have in our home library. I liked the art project you created to go with it. I love how you made the water color art! Thanks so much for stopping by my blog so I could find you! Your blog is wonderful, I only wish I had a Mo Willems activity to share! I taught Kindergarten for many years and really miss it. I missed your plant activities blog hop (darn!) I have a fun chlorophyll rubbing activity that would be fun for little ones! Oh, I'm your newest follower!